The Château de La Brède from the 11th to the 16th century. “I would be overjoyed to take you to my country estate at La Brède, where you will discover a truly Gothic chateau […]” (Montesquieu to Abbot Guasco, 3 July 1744). The Château de la Brède is not an easy edifice to date. The first mentions of a lord of La Brède can be found in the tale of a duel in 1079 between the lord of La Lande (or Lalande), who was lord of La Brède, and Hernandes, the champion of the army of Navarre. At that time there must have been a fortified feudal castle, built on an artificial mound created with the earth dug out from the moats. It was probably a wooden structure, in common with most buildings of the aristocracy in Roman times. In 1283, the castle was more than likely destroyed as a result of an attack. 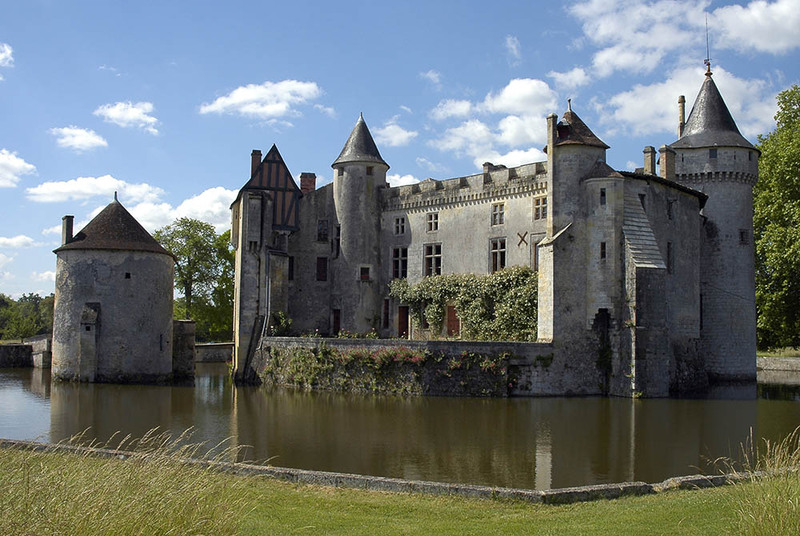 It was rebuilt in 1285, the date of the first document which mentions the Château de La Brède. The structure of the chateau gradually developed as the moats were enlarged. The original area of the Roman mound remained and a large square courtyard was created, surrounded by moats. These were joined together to allow for circulation of the water. La Brède was not entirely spared from the conflicts and consequences of the Hundred Years War. In 1419, the chateau was damaged by French artillery fire and Jean de La Lande secured permission to fortify the structure once more. A third, oval-shaped moat was then created and connected to the previous two. In 1453, his son, Jean de Lalande, left for England. 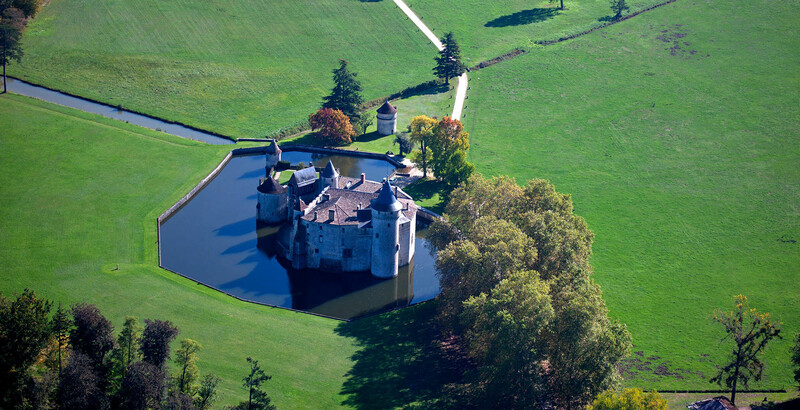 His property was seized by the King of France and the chateau was returned to him ten years later. At that time, the chateau was surrounded by a near-circular enclosure some 40 metres in diameter. A series of drawbridges protected by walls furnished with murder holes provided well-defended access to the main chateau courtyard. Following the marriage of Jean de La Lande’s great-granddaughter, the Château de La Brède passed to the Penel (or Pesnel) family. In 1577, the walls surrounding the moats were joined to form a single edifice, creating a large lake. The chateau was no longer a fortress but became a country residence. Just three drawbridges remained. The chateau now had its final form, and the external structure would subsequently change only very little. © Fondation Jacqueline de Chabannes – photographer: Jeremiah Buchholtz. The Château de La Brède in the 17th and 18th centuries. The barony of La Brède passed to the Secondat family with the marriage in 1686 of Marie-Françoise de Pesnel and Jacques de Secondat, the parents of Charles-Louis de Secondat, Baron of La Brède and Montesquieu, known as Montesquieu. 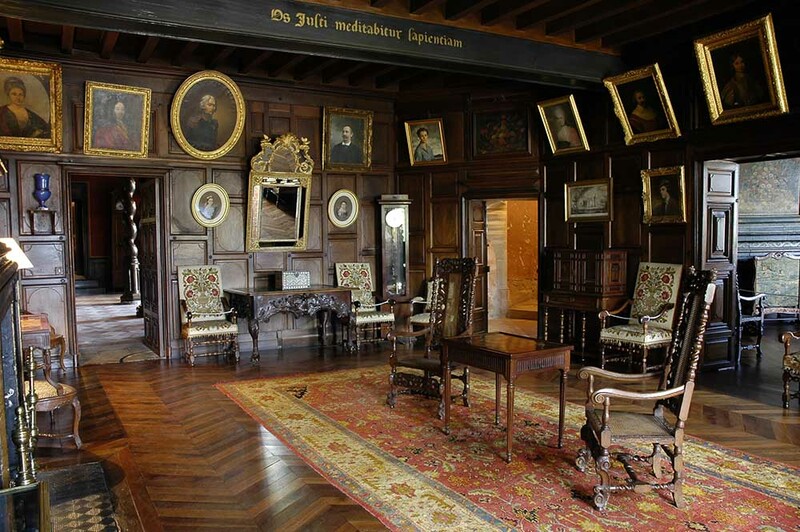 Jacques de Secondat is credited with fitting ornate and intricately carved walnut wood panelling in “capucine” style (painted in dark colours) and stone fireplaces painted with floral motifs or landscapes to match the door lintels in the ground floor rooms. He is also said to have converted the medieval great hall on the first floor into a library. Montesquieu made few changes to the chateau itself, but transformed its surroundings significantly. There were two reasons for the changes that he made. Firstly, they were practical, in the form of major irrigation and sanitation works around the chateau to allow the land to be cultivated. This consisted mainly of digging ditches and channels to drain the grassland around the chateau. The second set of reasons for the improvements to the grounds was aesthetic, born of Montesquieu’s desire to make his mark on the estate. Drawing directly on the book by Dezallier d’Argenville, published in 1709 and which he purchased in 1722, Montesquieu first created a formal garden with planting beds and pathways and an ornamental grove. The importance that this garden held for him can be seen in his correspondence with the Duke of Berwick. Various plans for the estate were discovered at the end of the 2000s, revealing the plays on perspective that Montesquieu had been seeking to achieve. This made it possible, in 2014, to recreate the great “green carpet”, the ornamental grove and the arbour, formed of hornbeam walkways that criss-cross each other in a series of small intersections to create a double star design. The Château de La Brède after Montesquieu: family life in a cultural landmark. “Assidue veniebat” (“He came here often”, inscription on the exterior wall of the Château de La Brède). When the French Revolution broke out, the Secondat family was no longer living at the Château de La Brède: Montesquieu’s son, Jean-Baptiste de Secondat, Baron of La Brède, was living primarily in his Bordeaux townhouse whilst Denise, his younger sister, was living on the Montesquieu lands that she had inherited in the Lot-et-Garonne area of South West France. Charles-Louis de Secondat, Montesquieu’s grandson, who had distinguished himself in the American War of Independence, left France for England. 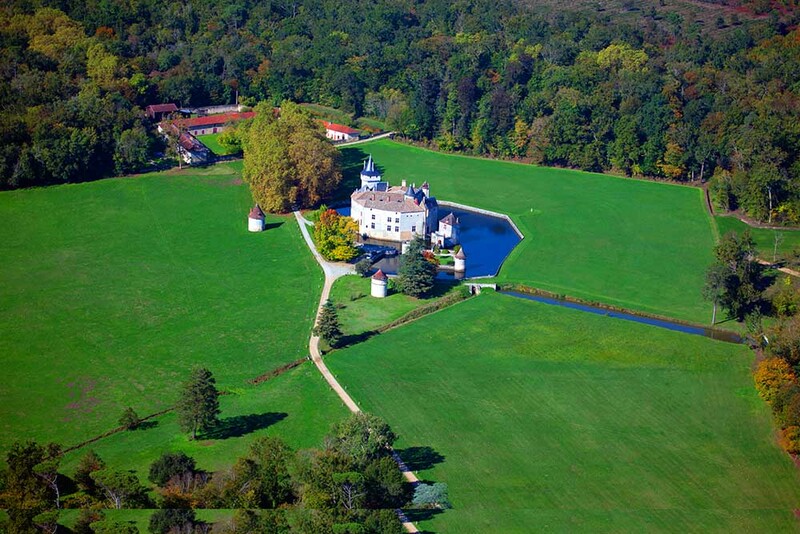 The chateau was seized as a national asset, meaning that it would have to be sold. This did not happen, but the abandonment of the building and its grounds during this time left its mark and the first few years of the 19th century were devoted to making repairs. In the absence of Charles-Louis de Secondat, the task of supervising this work fell to Joseph Cyrille de Secondat, son of Denise Secondat and Baron of Montesquieu. Nonetheless, Charles-Louis asked his cousin “not to make any changes […] to [his] grandfather’s former residence. His memory must be upheld in the place that created him.” This desire to immortalise Montesquieu’s legacy in the arrangement of the chateau was respected, and the ground floor room where the author spent the final years of his life was not affected by the improvement works that took place in the 19th century. Charles-Louis de Secondat died in 1824 and having no heir, Prosper de Secondat, the son of Joseph Cyrille, inherited his property and the title of Baron of Montesquieu and La Brède. 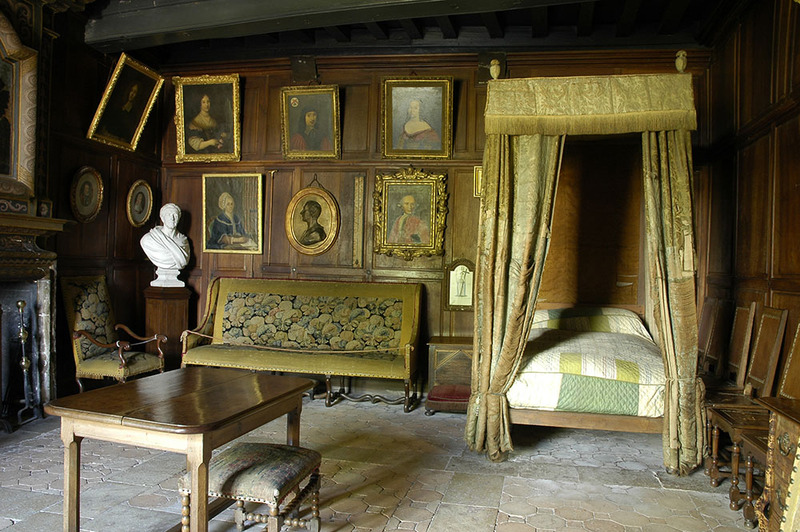 The Château de La Brède became the family’s home and various works were carried out. No changes were made to the external structure because of the moats, but the way in which the walls of the chateau were clad, its internal layout and the interior finishings reflected a shift in taste towards the increasingly fashionable neo-Gothic or Troubadour style, and in the way of life within a chateau. The nobility was becoming gentrified, with implications for interior decoration. Three major phases of work ensued. The first was the work of the architect Henri Duphot, who was responsible around 1834 for the crenelations on the main exterior wall and the ogival windows in the dining room, which was also created in the 19th century. Next came the work of Gustave Allaux, from 1863 to 1864. The exterior wall was remodelled once again, and the windows in the upper section were probably added at this time. Initial plans were made at the same time to alter the grand staircase, which was ultimately completely rebuilt by Dubert. It was, however, the work carried out by Paul Abadie, a pupil of Eugène Viollet-Le-Duc, assisted by Jean Valleton, that changed how the chateau was arranged. The work took place between 1870 and 1877, when Charles de Secondat, son of Prosper, was the Baron of La Brède. The separation between historical rooms and living quarters was made clearer. The residential rooms were substantially altered and their layout was modernised with a system of hitherto non-existent hallways. The desire for convenience also extended to the servants’ quarters and part of the attic was converted into maids’ rooms. The modernisation of the Château de La Brède did not affect the determination to keep the reminders of Montesquieu intact. Visitors, at first from learned societies or local academic institutions, asked to pay their respects in the room where Montesquieu had spent his final years. La Brède became an essential stopping-off point for any author visiting the Gironde. Stendhal, for example, left a detailed description of his impressions of the Château de La Brède when he visited in 1838. There is little in the way of documented history for the chateau in the 20th century. After the work carried out by Paul Abadie, it appears that there were no further changes to the external structure or the internal arrangement of the chateau. The two global conflicts during the 20th century had no major impacts on the La Brède estate, despite its occupation by German troops during the Second World War. In 1951, the Château de La Brède was listed as a French historical monument, with the whole estate being listed in 2008. The chateau ceased to be a family home in 2004 when Countess Jacqueline de Chabannes, the great-granddaughter of Charles de Secondat de Montesquieu, died, leaving the estate to the government-recognised public interest Foundation that she had recently set up. The chateau and its estate have since become a place of cultural interest and a tourist attraction for visitors keen to tread in Montesquieu’s footsteps at La Brède.